Yesterday, our route took us along the road where the sudden blind turns could get you reduced to a coating on a wall. Today Google chose a different, safer and more interesting route for us. It took us through areas where the term road, pavement or surface would be a misnomer. This was not the bazaar but a place where people live and is empty of tourists. Many people along the way thought we were lost, or headed in the wrong direction and tried to put us on the right track. That we didn't want to be put there, was a source of concern to them. Eventually we found it easier to show them the phone and say the magical word 'GPS' . The route was very convoluted and it took us down narrow alleys and across small squares, but we emerged on to the main road out of the old town via the indoor spice market. This has dozens of stalls all piled high with sacks and barrels of spices and potpourris, joss sticks even. At this time of day it was fairly empty and we made rapid progress through it. Out in the street again, we came to a shop selling lengths of cloth. I have to say at this point that we have become lazy with our language learning in Marrakech, finding that we can get by in French in almost all places and even in Spanish when necessary, our vocabulary is not advancing. To get back to the shop. Christina took a fancy to a beautiful piece of turquoise cloth with a stripe of various colours in it. The owner appeared and we asked how much. He said 200dhs. Right we thought, let's start the haggling. We looked at each other as if trying to piece together an opening bid for him to reject. “100dhs?” “Non, 200”. This wasn't supposed to happen. “150?”. “Non, 200”. He offered to show something for 150dhs. That's not what we wanted. Christina found another piece of fabric, equally desirable. “Combien?” ” 200dhs”. What did he want for the two? Something we had been told would always produce a reduction in price. It's almost a law of barter. “400dhs”. That can't be right. He must be from John Lewis' haberdashery department. Some Moroccan women come in and examined the same fabric. Christina asked how much they would pay for the cloth. Not more than 150dhs each as they were not the best quality. “Why are you listening to these women, they are only customers” the shopkeeper fumed. The women were furious with him. “How can you charge that much for this cloth?”, they asked. Turning to Christina “Do not pay more than 300dhs for both pieces. They are not worth more and he is trying to ask too much for them,”. “300dhs?” She offered. The man waved his hand dismissively. We walked to the exit. Surely this is when he comes back with an offer, but no. We emerged into the sunshine, not sure what to do. We needed to to consider our next move. Heading for the modern part of Marrakech we thought to take in a garden or two. 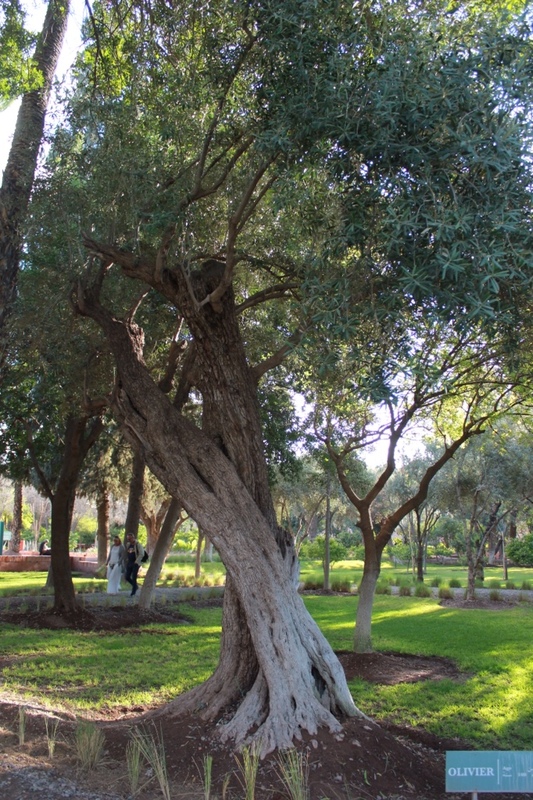 The city is famed for its gardens and we wanted to see some of those marked on our map. Walking up one of the main avenues, we saw a sign for a crafts centre. In some cities we visited, these can be repositories of less than inspiring, overpriced, imported junk. Or worse; overindulgent, badly conceived, poorly executed, sentimental rubbish. You takes your choice. This one was neither. 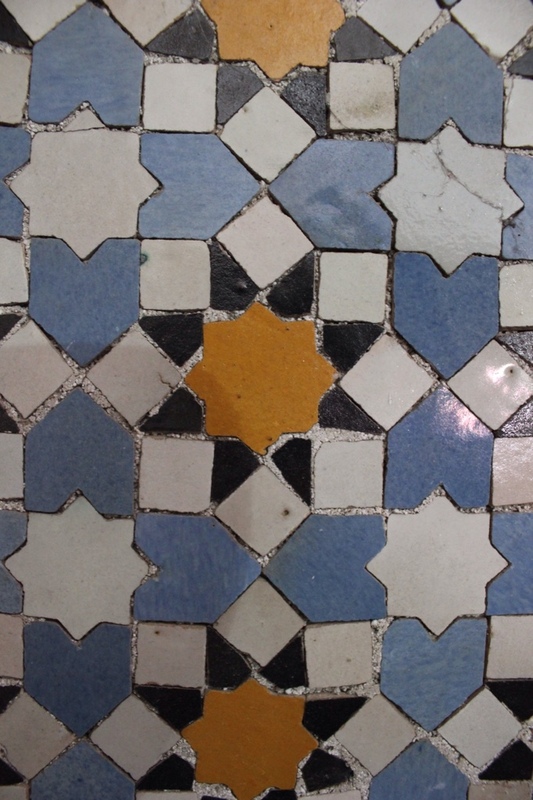 From the ornate tiles at the entrance, we got an inkling that something inside was worth seeing at least. It didn't deceive. 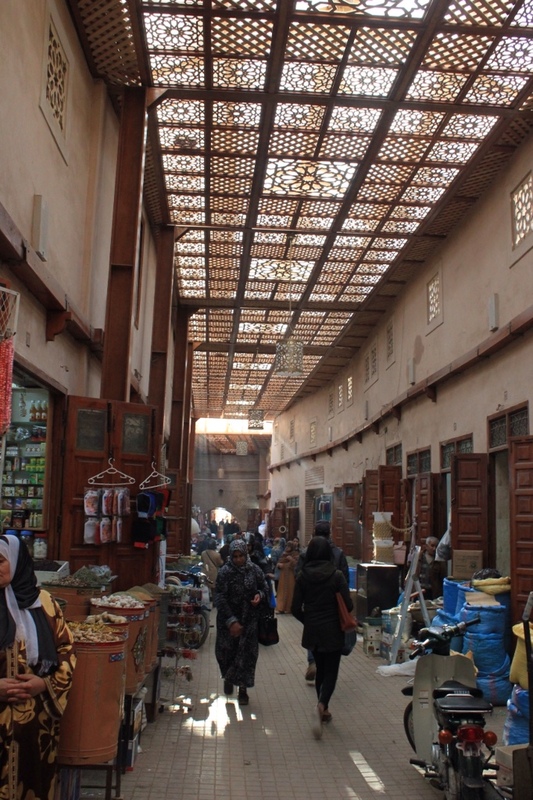 From clothes and hats, to metalwork and pots, we found items that we had seen versions of in the Medina markets, but these were of higher quality. We bought crafts and ate lunch there, before ambling away, many kilos heavier. 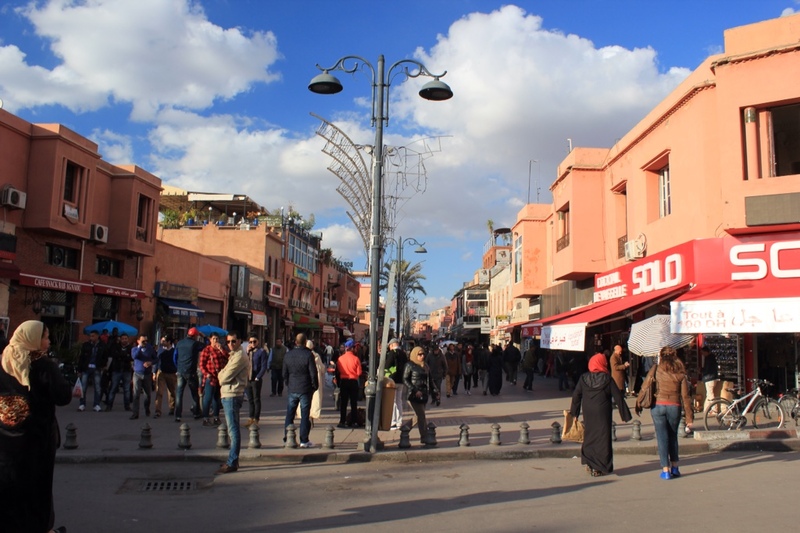 The part of Marrakech we were in became more upmarket and middle class, although the pavements put a restraint on the area's upwards mobility. It would be easy to put your Guccis into some quite large holes in Marrakech sidewalks. The avenue we were on was lined with orange trees full of ripe oranges. I wondered why nobody picked them. Were they ornamental and tasteless, or was it not the done thing? My fingers itched to reach up and pluck one, or pick up a fallen specimen from the pit beneath each tree hole in the paving stones. The possibility of being shouted at was more of a deterrent however, than the thought of being marched to the nearest set of three policemen that are a ubiquitous sight in Moroccan cities. They always come in threes. One in the middle marked police dressed in black and the two flanking him in combat fatigues and rifles pointed down, is how you see them. This arrangement is never varied. I'm not sure if the bread around this law enforcement sandwich is civilian or military and I'm not about to satisfy my curiosity by asking them to explain. I can certainly live without this knowledge. By now the shops around took on a different nature. Huge H&M signs, Starbucks and other western retail giants are here in force. We hadn't come to find them, but it's all part of the experience and I wouldn't pretend that all of Marrakech was like the Medina. There are indigenous shops, locals earning a buck from tourists. But here it was rows of men doing shoeshine, selling sunglasses or offering money transfers. We sought out the advertised tourism office, just to see if there was anything nearby we shouldn't miss. First we looked in vain for a modern shopfront with the Moroccan tourism sign on display outside, but no luck. As we retraced our steps we found it. Not in a shop, nor in a rundown building. In fact it was quite imposing from the outside. Inside, it looked like they were not ready to open for the season. A solitary desk in the corner of a large room, buzzing with flies. Monitor leads hung down from what might have been intended as video demonstrations along two walls, but they were disconnected. A table strewn with a confusion of leaflets and one man behind a desk, who got up to greet us politely and courteously. We asked him about local things of interest and the possibility of taking a bus to the Atlas Mountains for a day trip. He was sure no buses could go there and offered three alternatives; an organised tour, a hire car or a taxi. We said we liked bus travel, in case he mistook us for sensible people. No buses go there, but he pointed to a painted panorama of the areas around Marrakech with plenty of places highlighted that were within the radius of a day's taxi journey. It could be that this office is staffed at a minimal level during the winter. We know lots of places where the office might have been closed out of season. But it looked forlorn and not cared for. Perhaps the victim of cuts. After all, there were plenty of banners along the road advertising the Marrakech Biennial, already underway. Taking his map and advice away to consider at length, we walked off in the direction he'd given us towards the post office. We struggled to find it, not being given any indication of how far away it was and which side of the avenue. Our tourism advisor had been interrupted in his instructions by a phone call and we hadn't cared to wait any longer. When we did make it, there was a plethora of options and a lot of people sitting in chairs not queues, waiting their turn. We were directed to an enquiry desk. As we stood in line, an official approached and asked what we wanted. “Timbres de poste?” We asked. He pointed to the far end of the hangar sized building and said what sounded like “Bureau de change”. We pointed to our postcards at the spot where we would very much like stamps to be, if they were to arrive in England. He got very annoyed. “Bureau de poste, c'est la bureau de change!” He didn't add “Imbeciles!”, but he meant it. 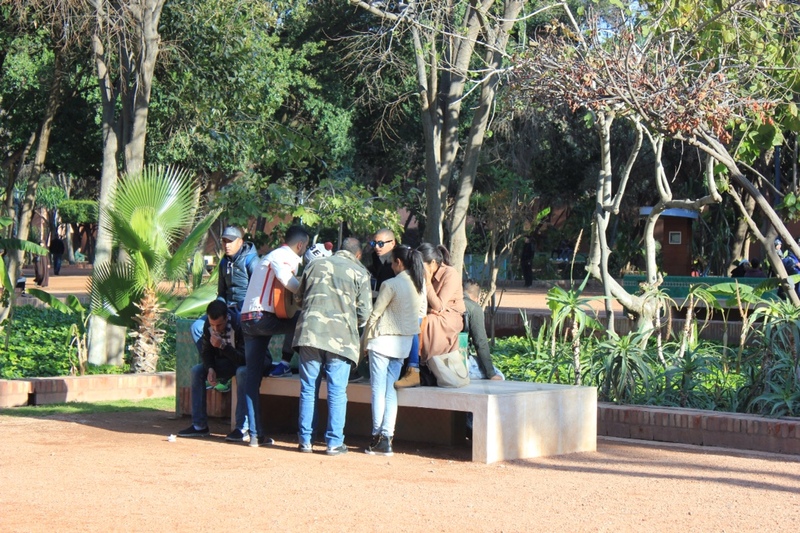 Down the road, we came to one of the famed parks, now named Cyber Parc in honour of its Telecom Maroc sponsors. Apart from that there is nothing very cyber about it and its green lanes and fountains provided a meeting point for many young people, including courting couples. There, a crowd around a guitarist, one foot up on a bench as he played, listened to him and a singer of some kind of folk song. 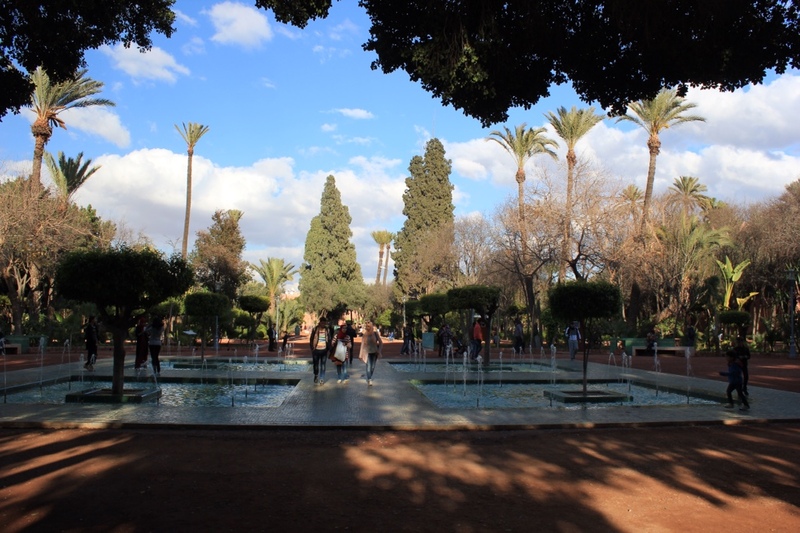 It is a sign of how much these green spaces mean to the people of Marrakech. It made me realise that the presence of cats in the streets was matched by the absence of dogs being walked. On our long walk back from the park we saw people heading home from work. One sight not to be forgotten was a man riding pillion on a small motorbike, clutching a painting on a stretched canvas frame. The canvas was at least as big as him. It must have acted like a sail on the bike and of course we can only speculate as to whether he was taking it home, delivering it, or making the paint dry quickly in order to sell it the next day. We deliberately chose to walk past the fabric seller's shop. He was there with a group of local women deliberating over a purchase and therefore not in a position to rush out and accept the need to bargain with us. Quite by chance they were looking at the same bolt of cloth. As we watched, they began to walk away leaving him to fold it back up as they left the store. He no doubt saw us, but did not relent. How is this standoff going to end? The spice market was crowded, the sellers more persistent and the would be guides and advisors more determined to get our attention on the way back. One well used trick is to ask “What do you call this in England?” As they point to something on their stall. It doesn't matter if you know or not, as you are reeled in to a sales pitch. This clever ploy only works with those non Welsh speakers in the audience. In the back lanes, tiny shops had opened up and were selling food and drinks to local men and women. Old men sat in the street against the base of the walls, catching the last rays of evening sunshine. A man on a motorbike, swinging an unplucked and possibly live chicken, swerved around us. At a kiosk selling groceries we stopped to ask the shopkeeper for some glue. The stamps we bought for the postcards and letters, refused to stick to the paper. We needed some adhesive if we are to avoid being cursed by people having to cough up good money to read our highly amusing if somewhat inane messages to them. Even wishing they were here isn't going to appease them. The man isn't sure what we want and neither an elaborate mime of sticking paper together, nor attempts in French, work. Then, as we move away, he cries aloud in celebration of our acting talents and reaches up behind him for a tube of UHU glue. If only we'd known he was waiting for the curtain to fall at the end of the performance, we'd have cut the script to the bone. If you've been following our travels hoping to learn something of the nightlife in these parts, I'm afraid that we disappoint you. After long days travelling or pounding the streets we are invariably exhausted, rempu, knackered and fall asleep at the first point we sit down. We try and eat out at a restaurant in each city, but often we choose to buy local produce to take back to our room and make ourselves up a meal. Tonight we did this with olives, cucumber, cheese, bread and tomatoes and a punnet of local strawberries. We do try cooking and are sure there is a cook book to be written on how to make use of an electric kettle and a trouser press in putting together an impromptu feast. But please be aware that this can get you banned from Travelodge. Sweet. Rempu? Nightlife? No, I expected more train spotting 🙂 It was relentlessly raining all day here so it’s nice to have someone elses sunshine come through the door so to speak. Hi Stephen. Not sure of the spelling but I think it’s right. Rempu is a bit of Marseillaise slang for exhausted. We’re heading into bad weather now. Hope yours has improved.